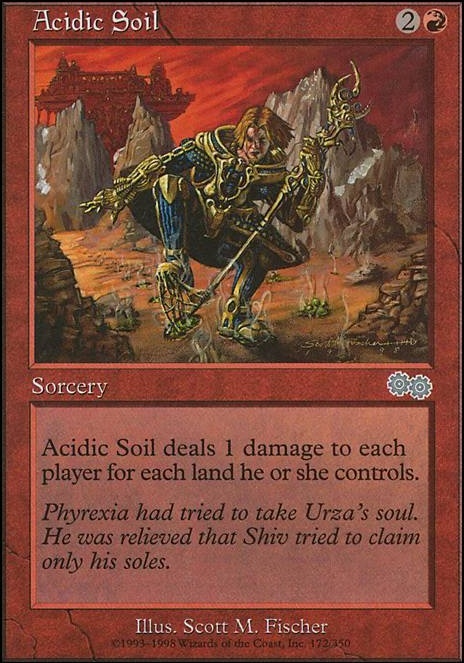 Acidic Soil deals damage to each player equal to the number of lands he or she controls. Assault Strobe is sort of a must. Crimson Wisps may also be good. Price of Progress is typically better than Acidic Soil . Very Solid. There are some sub-optimal choices imo, but overall, nicely focused. Shock is just not worth the slot in EDH. 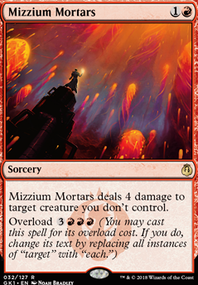 Leyline of Lightning is ok, but can be pretty mana intensive to keep using, especially in a land destruction deck, I don't see it being worth it. Guttersnipe is always nice, but with you creature wipes, you might kill it without a big payout. Keep an eye on how many X spells you have too, you might be shooting yourself in the foot, unless you add more artifact ramp, like a Fire Diamond and Ruby Medallion . Treasure Nabber can put everyone between a rock and a hard place if they are using artifact ramp. You'll also need some more card draw so that your single target removal keeps up with the board. 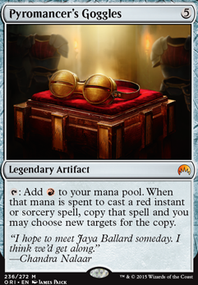 Pyromancer's Goggles can help keep you up with 3 other players. If you fall behind, Acidic Soil and Price of Progress might be nice backups. Mana Web , War's Toll , Tectonic Instability might slow everyone down too. Red has a huge weakness: Enchantments. You might want to add some enchantment hate, just in case. Even though they are costly Meteor Golem and Spine of Ish Sah are ok. Enchanter's Bane could fit in here real well. I know you love your goblins, but I think Stuffy Doll is just better than Mogg Maniac . If you really want to anger people, mass land destruction is best: Ruination , Obliterate , Jokulhaups , Decree of Annihilation , and Impending Disaster are the most well known. Even an early game Tremble could be infuriating. If you your deck can get some tokens, or just fodder creatures Shivan Harvest might be fun. Mine Layer would cause a lot of frustration. So would Price of Glory , but it can hurt you too. I personally love Volcanic Offering because it can make someone mad at someone else. Bend or Break can divert some attention from you too. Burning Earth Fits this deck pretty well. Maybe, Burning Sands too. The Price of Progress / Acidic Soil wins are some of my favorite, just because they are so unlike traditional wincons. 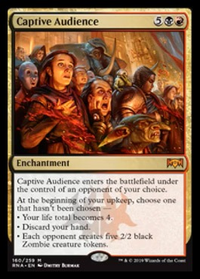 They also punish green or other landramp decks so much more than anyone else that it really helps to balance out the disparity between the colors. If I could get more of these effects, or get to them more easily, I definitely would cut a bunch of cute cards to do that. Your favorite game was such a fun line, congrats! I've had a similar thing happen (I Mogg Infestation myself way more often than I target anyone else), where it snowballs from 1 or 2, to 5, to 10, to a dead table. Finally deciding to run Fork and Reverberate was a big deal because it's dedicating two slots to things that rely so much on your or someone else's draws, but once you get to copy a huge draw spell, or a Goblin War Strike like that, it's takes all those apprehensions away. Also being able to use Goblin Sledder to pump up Ib one of the very few times I've attacked with him, and getting in a lethal commander damage swing from a 3/2 out of nowhere is great to always keep people on their toes. The more they have to guess the route we are going to take, the easier it is to keep tricking them. After a few game winning War Strikes lately, I've been working to get its closest equivalent, Massive Raid , a spot in the deck as well. It really helps cut down the number of turn it takes to kill a table. My group has gotten to the point where they never assume I am out of the game, which was originally really annoying to get focused a little bit no matter what, but then I realized that I should take it as a compliment because, like you said, I made a deck that has a number of avenues to win, most of which don't rely on much of a boardstate at all, so can I blame them? I'm happy you are having fun, and success, with the deck. It is something I am very proud of, and I think it is so awesome that other people get to enjoy it too! empireScum: Thank you for the comment! So I don't actually play this version of the deck, it started from when someone asked what the budget version of my $1200 deck would look like, back before I reworked that one to cost a lot less. There are two reasons those lands are included, first being that I took my old list and trimmed everything above $3 in my first pass (why Great Furnace is still there), and second to add back a few more artifacts for the sake of Goblin Welder (who I have an easier time tutoring for). My regular deck normally has between 18-20 artifacts, but it also has heavier draw effects, so it's easier to get to them. I wanted to treat this as more of a template, so if someone wanted to add anything from a Daretti, Scrap Savant (I'd rather sac a land than most of the artifacts in the deck) or even a Mox Opal that care about number of artifacts, they wouldn't need to adjust a ton more cards to compensate. It's a nice middleground for a few of the ways you can take this deck (artifact heavy, combo heavy, token spam, etc...). So at first glance, especially compared with all the other Ib decks this one looks like it has about 20 mountains too few, but after playing with Ib for a few years now, more than 38 or 40 sounds crazy to me. With that being said, the number of mountains can definitely go up or down depending on the type of extra land effects the person is running. 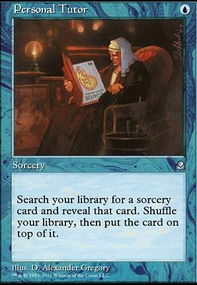 The main deck is much heavier on library-to-battlefield type effects and has few (or no?) land fetches that go into your hand instead. This deck plays a few turns more slowly, so it includes a lot more hand-to-battlefield effects ( Walking Atlas , Terrain Generator ,etc..) since your hand is more likely to be full, and you get more total turns to draw. I tend to cast Price of Progress or Acidic Soil , or both, probably every other game, and even at 23x Mountains it always feels like enough, but I also have Magus of the Moon and Blood Moon , two cards I think that should be some of the first upgrades to this budget version. 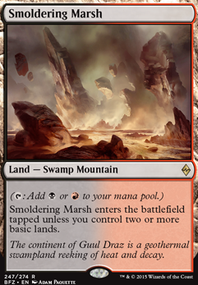 You're right that they are easier to remove than a normal land, but there are very few nonbasics in this deck still, and the kind of decks it would probably be played against have 3-4x as many nonbasics (some of the last commander decks had more than 25 enters-the-battlefield-tapped lands). PoP and AS aren't going to hit us hard unless we get every single land in the deck out, in which case we sac all but the 6 nonbasics, take 18 damage and everyone else takes like 60. There are many games where I get to do the land-punishment combos where I end the game with single digit health, but I took down the whole table. 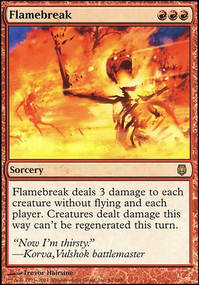 Being mono-red there isn't really a way to make that any easier outside of Basilisk Collar , the only way I've found in mono-red to get any kind of meaningful health back. 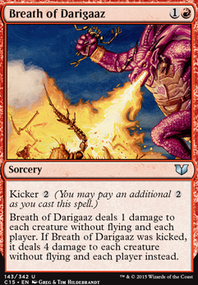 If I had to decide on changing something I would leave all the lands, but maybe add in a Daretti now that he dropped in price a bit more, or a Molten Psyche if I ran some wheels or my opponents had decks that draw lots of cards. That way I could take advantage of the artifacts a bit more. shbones: Thanks for commenting! That is awesome! 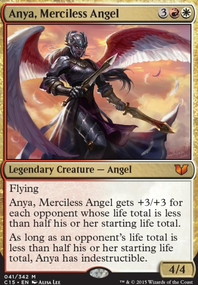 He is definitely a fun commander, and no one really expects him at the table. It seems odd, but most of my games are spent with very few tokens on the battlefield until the last turn or two. The rest of the game is spent setting up in whatever way makes sense for the cards I drew, which is why I have as much redundancy, lords, and alternate wincons that I can. Krenko definitely speeds stuff up, but he also gains the attention of the whole table, where if I play without using him I can take advantage of EDH politics more, until it's too late to respond. Most of the time I tutor for the exact lord that I need to combo out. I'm going add maybe one more token generator or doubler, but otherwise I am very comfortable with where it is sitting. Ib, ability doublers, and all the extra lands drops definitely makes up for not using raw token generators. It's also more all-or-nothing, but that's what an Ib deck is all about! Shared Animosity/Raid Bombardment makes fewer Goblins do more work when needed. Purphoros, God of the Forge/Impact Tremors makes instances where tokens die immediately (Elesh Norn, Grand Cenobite), or don't get to attack (Ghostly Prison) into games I can still win. Just last week I won a 3 person game by attacking one person with 20 hasty Goblins with Goblin Goliath out doubling damage, and hitting the other player with a Goblin War Strike that got doubled as well. I've won more games than I should have on the back of Price of Progress/Acidic Soil or Blasphemous Act/Repercussion. I think with tribal decks, especially with the ones that can spit out tokens like crazy, it's too easy to get caught up in generating as many tokens as humanly possible. It makes the deck really linear in the sense that you can only win with combat damage, and once you get a battlefield of 100 goblins you have the whole table trying to kill you, and a single boardwipe can be unrecoverable. The way the deck sits now I can pretty much work around 1-2 boardwipes a game before there isn't enough gas left in the deck, and that fits really well in my meta. Depending on your meta, you might have to make some adjustments to that.